(Sasha Bogursky@ FoxNews) An Israeli start-up claims its software will put an end to all viruses and malware, even anticipating attacks and blocking them before they are created. That’s because viruses are copycats, said Liran Tancman, CEO and co-founder of the 10-person software firm Cyactive . Creating new code for each new piece of malware is expensive and impractical – and nearly impossible, he said. "There has never been a documented attack that has not used at least one recycled component," Tancman, who headed cybersecurity at an elite military intelligence unit in Israel, told FoxNews.com in a phone call. "Hackers modify the original code and then, voilà! A new threat is born." But not everyone is ready to jump on the bandwagon. Claims of a cure for all computer viruses are made all the time, PC Magazine editor Neil Rubenking, a leading cybersecurity expert, told FoxNews.com. "This claim gets made year after year, again and again," he wrote in an email. He said a similar product called Prevx “created a very nice behavior-analysis tool some years ago.” And Cyactive might even be simpler than that product, he said. 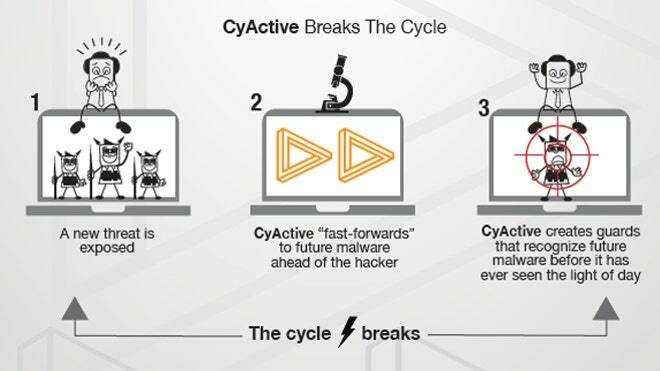 "[Cyactive is] just looking for re-used code from known malware. I'll be interested to see if it holds up in testing by the independent labs. But just looking at the claims, I see nothing new." But Tancman insists his software is innovative and will hold up to industry standards. Consider the recent hack of millions of Target customers' credit card numbers, where hackers used a remodeled version of an existing piece of malware called BlackPOS. Tancman claims the attack would have been thwarted before it caused serious damage if Target had been protected by Cyactive. "When a threat is exposed, we predict that malware's evolution to protect an organization before the black-hat hackers even write it," said Danny Lev, Cyactive’s chief marketing officer. "We have the ability to see the future and prepare for it." Added Tancman: "You have today a lot of security companies that are trying to build smarter detection systems. We also give you smart rules, but those rules are not learned on the past but they are learned on the future." Another way that Cyactive is different from other virus-protection companies is that it also protects the "Internet of things,” a term coined by British technologist Kevin Ashton in the ’90s that refers to the growing trend of connecting all of our devices to the Internet. From lightbulbs to refrigerators and toothbrushes, everything is web-connected today -- and therefore at risk of being hacked. "The detectors that we use are very lightweight," Tancman said, "meaning we are not restricted to one kind of device. Our security can be deployed on normal PCs as well as ... things like refrigerators to turbines and critical devices." But even Cyactive is not completely safe from hackers, he admitted. "It will be more difficult for hackers to overcome, but they will," Tancman said. "We continue to ask our smart algorithms to tell us ways in which hackers might fool our own detectors. This is how we maintain an advantage." "We hope that with our solution crime doesn't pay anymore," Lev said.